Conference at the European Parliament: "Armenophobia as a clear demonstration of Xenophobia". 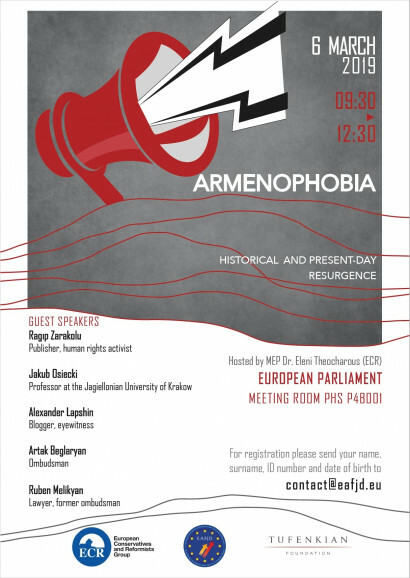 Brussels, 06 March 2019.- On March 6, 2019, MEP Dr. Eleni Theocharous hosted a conference entitled "Armenophobia: historical and present-day resurgence" in the European Parliament. The event was co-organized by the European Armenian Federation for Justice and Democracy (EAFJD) and the Tufenkian Foundation. The President of the National Assembly of the Republic of Artsakh Ashot Ghulyan, was the special guest speaker of the conference. More than hundred attendees were present at the event, among them Members of the European Parliament, representatives of civil society, as well as Armenian community members. In his opening remark, the EAFJD President Kaspar Karampetian welcomed the participants and emphasized the importance of addressing the issue of Armenophobia at the European Parliament. "Seeding hatred can never be a solution. The relevant bodies of the EU and in particular the EU Special Representative for Human Rights must encourage Turkey and Azerbaijan to stop the policy of nurturing anti-Armenian sentiment, " said Karampetian. "Armenians are peaceful people with strong ideals and high capabilities of coexisting with everyone", stated MEP Theocharous. She expressed conviction that the Armenian people in fact predispose every conscious citizen to feel Armenophilia, sympathy and respect for Armenia. In this regard, Mr. Ashot Ghulyan stressed: "It is even more dangerous when xenophobia and hate speech become a state policy, calling into question the peaceful coexistence of peoples in the short and long term. A society poisoned with xenophobia can never and under no circumstances create a public and universal value". Human rights activist Ragip Zarakolu highlighted the historic and current level of hatred towards Armenians in Turkey. He said: "Armenophobia was always strong in Turkish history. Armenia was an obstacle to the realization of that time’s pan-Turkic ideology which led to the perpetration of the Armenian Genocide". The former Ombudsman of Artsakh Ruben Melikyan elaborated on the manifestation Armenophobia in the education system and media in Azerbaijan. He said that hatred against Armenians is being spread among children in the in schools and kindergartens of Azerbaijan on purpose. Melikyan presented the report published by the office of Ombudsman of the Republic of Artsakh entitled "Armenophobia in Azerbaijan: organized hate speech and animosity towards Armenians." Well-known Russian-Israeli blogger Alexander Lapshin who was persecuted by the Azerbaijani authorities, presented his personal experience and stated: "I see some parallels between modern Azerbaijan and Nazi Germany during the beginning of World War II. Today, the propaganda of hatred towards people of Armenian descent is the basis of the state policy of Azerbaijan, " concluded Lapshin.